Area architects may be struggling to find enough work to fill the day in the last year or two, but this informal group checked the wish lists when the want ads went dry. 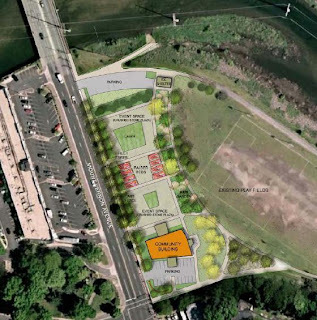 The highlight of last Wednesday's inaugural Arlandria Action Plan Advisory Group meeting, planning for Four Mile Run Park (4MR) expansion, received a pro bono shot in the arm that can only be described as transformative. 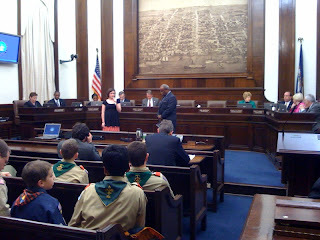 The architects presented the group an exciting presentation and took questions (and accolades). Parks and Recreation Commission Chair and Architects Anonymous member Judy Noritake was quick to point out that this is only a vision, and a formal planning process will follow. However, the group went out of its way to identify some of the most cost effective and quickly implementable solutions possible for this blighted stretch of Mt. Vernon Ave. They laid out the framework for a phased approach that could have a usable public amenity available to the community as soon as this summer. I have a feeling the planning process will likely be more like project management, figuring out schedule, funding, and process to implement their suggestions. First, a quick bit of history. The city purchased the lots for park expansion 2+ years ago and completed a lengthy environmental remediation. They tore down 3 of the buildings and were hoping to re-purpose the Duron building for park use. See two of our prior posts on the topic here and here. The problem was there's barely any money to fix it up. On came the wrecking ball... or so we thought. The architects adopted this pet project to provide the public with a valuable amenity that the City would not be able to otherwise afford (it will still be tough going money-wise). 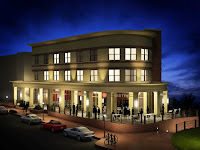 The vision all starts with a re-purposed Duron building--see following image. The architects propose punching a hole in the North wall and building a stage that faces the three vacant lots. The opening will be covered by a 'barn-style' door. The mural that is currently mounted on the South wall would be moved inside and enhanced by surrounding it with more art, perhaps the product of local artists. The space would be lighted with light tubes (~$400 each) that would harness the sunlight to light the space during daylight hours with zero operating costs. The architects suggested painting the exterior in bright, creative patterns that reference the cultural elements of the neighborhood and the artistic uses of the re-purposed building. 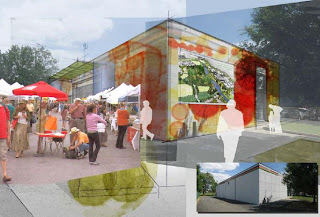 The building could host community meetings, indoor/outdoor markets, performances, temporary art displays, act as a base for school field trips to study the stream, and much more. Existing restrooms would be refurbished for daytime public use. One resident suggested the space could house periodic immunization clinics to relieve some of the pressure on overburdened local health clinics. The three vacant, paved lots could be handled in several different ways. The asphalt is in decent shape, so for the short term, it can be left as-is. Hard-scape restrictions for areas near 4MR mean that, if we ever plan to use hard-scape in the area, we must keep the impermeable space intact for now. Each asphalt ring surrounds a gravel space where buildings used to stand. 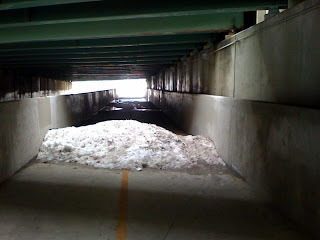 This space could be planted over with grass, gardens, or any permeable use. 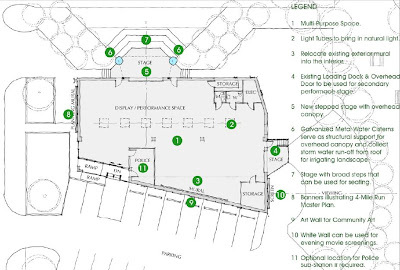 The lots could be used for outdoor markets, seating space for performances, or just a community gathering space. The park expansion could interface with the existing park much better than it does today. The architects suggested tearing down the various fences that break up the space and separate it from the rest of the park. They also suggested connecting existing trails to the space with walking paths. 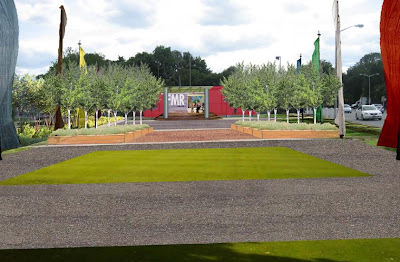 Lastly, tree and garden plantings would tie the formal "outdoor rooms" to the athletic fields while creating distinctive places within the park. The architects introduced a number of creative, affordable, and sustainable ways to improve the space over time. 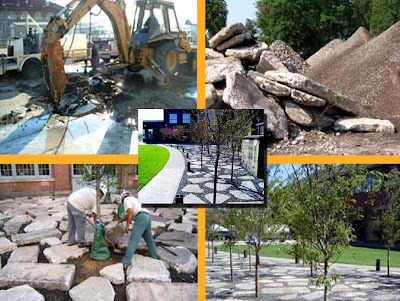 They suggested using recycled concrete to beautify the vacant lots (my favorite... see following image). The entire area would be bordered with a rain garden on the eastern edge to mitigate some of the runoff, and permeable paving options may be possible, as well. They suggested cisterns to catch the roof runoff for landscape maintenance. Over time, simple banners could give way to public art that announces the plaza to the public. Often, municipal planning processes are bureaucratic, snail paced ventures. There is generally a group opposed to any kind of change, a group that wants to maximize change, and the planners that want to make sure that whatever happens is in line with a long-term vision (sometimes an outdated one, but their intentions are mostly good). Arlandria is both blessed and cursed with overlapping plans and zoning overlays that can make project implementation even more difficult. Not this time. The architects were careful to adhere to the vision laid out in the 4MR Restoration Master Plan. The community was in attendance, and almost everyone spoke out in favor of the presented vision. Arlandria has been starving for some attention for too long not to move forward with this potentially iconic project. The formal park planning process will begin sometime in March. It looks like a Special Use Permit (SUP) will be required to re-purpose the Duron building, but Open Space Coordinator Laura Durham and Judy Noritake hope that they can rush through the SUP process so the community does not miss out on an amenity for this season. We may request some community support for this in the near future to grease the wheels. Also, please start shopping around for interest from farm markets, arts and crafts fairs looking for space, and performers looking for a venue. Showing that we're ready for our day in the sun may "prime the pump" for this new amenity. We'll probably have to rely on sweat equity, donations, and limited Open Space funding to convert the existing site to into the vision over a series of years. In year one, we hope that the community will rally behind this and lend their hands to help where possible (plantings, generating interest, painting... who knows). We will announce any volunteer days that occur and hope this will be a rallying project for the community. The architects have done their jobs, now it's up to us and the City. What do you think? Discuss in the comments! They're called spaces between places, forgotten areas susceptible to blight and vulnerable to crime. 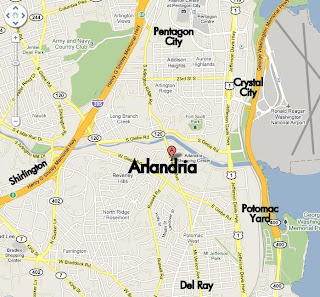 Arlandria, a community bordering Alexandria and Arlington, is arguably one such area. Arlandria is an easy walk from some of both cities' premiere destination locations, but visitors driving through this neighborhood are too often more likely to roll up their windows and check their door locks than stop at one of the struggling, weathered storefronts. As small businesses continue to shutter in this long overlooked community, a small group of residents and business owners are combining forces with city staff to identify mutually beneficial ways to bring growth and vitality to this neglected area. "Community involvement will play the largest part in successfully executing a strategic plan to tap the potential in this area," said Alexandria Councilman Rob Krupicka of the newly formed Arlandria Action Plan Advisory Group, whose goal is to find ways to expand business retention and attract development. Those goals appear to fall directly in line with the city's - Alexandria City Council adopted a Strategic Plan for Economic Sustainability in 1994. Updated this winter, the plan is an effort by Council to move the City forward in realizing the goals of the community. The group also hopes to create much needed synergy by working to remove zoning barriers that stand in the way of development. "We hope to support efforts to establish a financially sustainable and efficient neighborhood," said Nick Partee, the vice president of Hume Springs Civic Association, when asked about joining the Arlandria Action Plan Advisory Group. "We enjoy living here. This is a great, diverse community and so close to everything. I just wanted to be part of the process in turning things around. Everyone in Alexandria deserves to live in walkable neighborhoods, near decent parks and community oriented businesses. Arlandria ought to share in the community benefits and not just bear the negatives." Jim Matthews, one of the owners of the world renowned Birchmere, an Arlandria entertainment venue, believes addressing outdated, cumbersome zoning constraints is all the neighborhood needs to create a vibrant place to live, work and play. "Here's a perfectly wonderful project," he said. "Arlandria could turn into a potential gold mine for the city. There's a water feature and access to metro. This part of Mt. 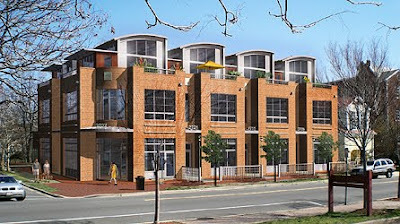 Vernon Avenue is poised to be a hip, dynamic gateway to Alexandria, we just need to make it more attractive to businesses." The group comes together at a time when the city is looking for ways to shift the tax base and create more business opportunities. The current shortfall could impact budgets across the board. "Cuts are impacting the police and the schools. Unless we find alternative revenue, homeowners will continue to bear the burden, and taxes will go up or services will be cut," said Krupicka. "There's virtually no downside here," said Matthews. "The challenge is getting busy folks in the community to show up and support the group. Developers are interested in this neighborhood, we just need to provide zoning that will encourage redevelopment." With developer interest comes the hope for public benefits, like an updated road network with more connectivity, pedestrian and bike improvements, open space and other livability enhancements. Not to mention the boon to the neighborhood job market. Development and a strengthened retail segment will bring jobs that local residents can get to on foot or with a short bus ride. Right now the stars seem aligned for this hopeful group of residents. "We want what the city wants. We never wanted to be a burden, and here's finally an opportunity for us to become a viable, sustainable part of this community," said Partee. "We just hope we have a good turnout." The Arlandria Action Plan Advisory Group will meet Wednesday, February 17 from 6:30 - 8:30 pm at Cora Kelly Recreation Center at the corner of Reed & Commonwealth Avenues, the first of three anticipated meetings this year. At last Thursday's Potomac Yard Planning Advisory Group (PYPAG) meeting, Alexandria's Deputy Director of Planning and Zoning Jeff Farner joked that this will "probably" be the last one, which drew a few tentative chuckles from the group. The planning of Potomac Yard seems to have gone on for years if not decades. The goal for the product of over a year of effort, the North Potomac Yard Small Area Plan (Draft PDF), is set to go before the Alexandria Planning Commission and City Council for approval in April. But, truth be told, until the Metro station funding is resolved, there is probably no point in sending it forward. Deputy City Manager Mark Jinks danced around the funding questions as everyone present tried to read between the lines. The good news is that what was an original gap was $75 million has been worked it down to $32 million by capitalizing the debt; rolling early debt service payments into the loan. Based on discussion later in the meeting, the City expects the rest of the gap to be closed by developers. Planning Commissioner Eric Wagner ended an awkward question session by saying that it is not the time or place to discuss negotiating points, but that they can "see the finish line," something they could not have said just a month or two ago. As it stands, the $32 million funding gap is still a problem, but they expect to resolve it before a plan goes to City Council. 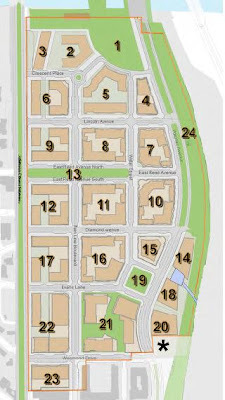 This is a planned area immediately around the northern Metro station entrance (Blocks 14 thru 21, except for Block 17) that is intended to be a pedestrian-intensive zone. The plan includes a roughly 0.75 acre park centrally located within the "Zone", surrounded on all sides by streets, with adjacent buildings facing the park. Much of the immediate area is intended for Office use with street-level retail. The general concensus (sic) appeared to be that Office use was more appropriate closest to Metro. I think the real item at issue is trying to maximize the value and quantity of the office space in the development without losing the vibrancy of quality mixed-use development. 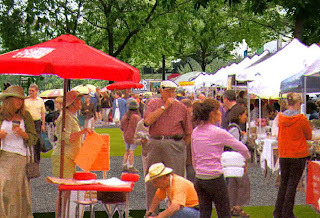 One citizen complained that they don't see how the proposed plan presented for the Yard decreases Alexandria's burden on the residential tax base (a much desired tenet of Alexandria's long range plans since 60% of its tax revenue is derived from residential property with only 40% commercial). Ultimately, the plan should bring in a tremendous amount tax revenue. PYPAG members were divided about whether or not to include a reservation for a school in the plan. Dept Planning Director Farner proposed that a school not be ruled-out, which would require shifting some proposed uses and building heights to accommodate the possibility of a school. Planning Commisioner Wagner and others thought that it made little sense to include a school on a prime residential block adjacent to the Circle Park and Four Mile Run. Mr. Wagner proposed postponing the decision about the location of a school in order to try to identify the best overall location as opposed to adjusting the plan to include the possibility for a school on-site. This item will be revisited by City staff. "... 16 million dollars in construction costs are anticipated for the dedicated transitway, with an additional $5 million anticipated for other transportation improvements, including a future east-west connection to Commonwealth Ave...". This last portion drew the ire of Mr. Wagner. He said he'd never heard any discussion of the east-west connection to Commonwealth Avenue and he thought it amounted to a "deal-breaker". City Transportation Planner Sandra Marks stated the likely location would be somewhere on or near the Jack Taylor Toyota site (see orange line on map below). Mr. Wagner and another Del Ray resident were very concerned that this item would dramatically increase the effect on the surrounding neighborhoods...mainly Del Ray. Lastly, City Planners went around the table and had each person voice his or her overall opinion of the plan, whether or not they support it, and any specific issues. All but three of the attendees supported the plan, and the three were among the most important members of the group: Planning Commissioner Eric Wagner, Potomac Yard Development, LLC (owner/developer of Landbays D, E, H, I, J, K, and L), and MRP Realty (owner/developer of landbay G). Mr. Wagner's lone issue was the east-west connector to Commonwealth Avenue. He supports the plan without the extra connector, but said that one street is a deal-breaker for him. He seems to think that all the work that was put into "protecting the neighborhoods" would be undone by this one additional street that is likely to just break up the logjams of E. Glebe Road and E. Reed Avenue. I'm skeptical that it would make any difference at all on Commonwealth south of intersection with East/West Glebe. Both owners of the properties south of the planning area (from just south of the existing Target location all the way down to Old Town) were not supportive of the plan as-is. They are both upset about an expected $10 per sqft proffer demanded by the City as well as the fact that they feel they are not being treated equally to Landbay F (the current retail center) in terms of the amount of public benefit expected of them. They also complained that they are being required to underground more parking than Landbay F, among other unnamed inequities. Planning Director Farrol Hamer said the City will be sure to treat the developers equally in comparable zoning uses and asked if the developers would support the plan without the $10 per sqft proffer. I was surprised at the public display and have a feeling they are headed back to the negotiating table. The representative of Potomac Yard Development, LLC essentially said they feel McCaffery Interests (Landbay F owner) should cut a check for the Metro funding gap since the upzoning in the proposed plan gives him an instant property value increase of about $240 million. Potomac Yard Development, LLC has already spent about $100 million in infrastructure improvements, including a new fire-station with 64 affordable housing units, and the new Monroe Avenue Bridge, among other projects. Mr. Wagner wrapped up by saying he thinks the Metro funding gap might be more than $32 million because of how slow build-out usually occurs. He thinks they might be too optimistic with the build-out schedule based on experience. Still, they're hopeful to finalize a financing plan by the City Council meeting on April 17th. This was not the positive message we've been hoping for, but despite the posturing between the city and various development interests, City staff insists that they're closing in on that coveted goal of a new Metro station. The final meeting of the Potomac Yard Planning Advisory Group (PYPAG) is scheduled for this Thursday, February 4th, at 7:00 p.m. in Room 1101 (Sister Cities) at City Hall. Tentative agenda items include a discussion of staff and developer resolutions to PYPAG issues, community comments, and final comments from PYPAG members. Will this include information about the Metro funding gap? Let's hope so. If you have an opinion to voice on it, this is the place to do so. ORIGINAL UPDATE: The City Council/Planning Commission "Work Session" scheduled for Tuesday, February 9th at 5:30 pm was tentatively rescheduled for February 23rd at 5:30pm in the City Hall Council Work Room (pending City Council ratification of new date). For those who remember, the in-fill Metro station faced a $32 Million funding gap that would have forced the city to either pony up or give up... or get someone else to pony up. With the current budget difficulties and fears about paralyzing the City's borrowing capabilities by maxing out its credit sources, that $32 Million was a deal breaker. It would seem that, less than a week before the Potomac Yard Plan was supposed to go before the Planning Commission, the developer is willing to come to the rescue. As you can see from next month's Planning Commission docket, the Potomac Yard Plan is not going to be discussed, after all. Probably to give everyone more time to close the gap. Who knows what horse-trading might be going on behind the scenes to make this Metro station happen, but short of selling a proverbial kidney, I say go for it. In fact, there's a joint City Council/Planning Commission "Work Session" scheduled for Tuesday, February 9th 23rd at 5:30 pm. The rumor around town is that there might be a proposal that has closed the gap. Keep your ears to the ground and post anything you have heard, read, or just want to speculate on in the comments!